Known by as many as twenty common names, including rough fish and Chinese high-finned banded shark (Myxocyprinus asiaticus), this unusual Chinese import is the subject of much confusion…both as to its natural history and care in captivity. 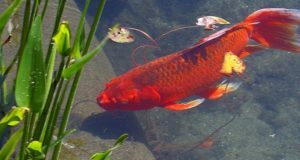 One thing is certain – this often over-looked oddity is among the hardiest and most interesting fishes that one might add to an outdoor goldfish or koi pond. Check out a picture here. Chinese sailfin suckers are believed to be endemic (found nowhere else) to the Yangtze and Minjiang River Basins in China. Yet rumors persist that the fish is native to Japan as well, and for a time the populations there were considered to be a distinct subspecies. Most authorities now consider the subspecies status to be invalid, but there is no consensus as to the origin of the animals living in Japanese waters (I imagine they are feral, introduced from China). Recent studies indicate that this fish makes extensive breeding migrations, and that its continued survival in China is threatened by dam building and over-harvesting for the food trade. The confusion as to the care of the Chinese sailfin arises from the lack of basic information concerning its natural history. Fueled perhaps by its “exotic” appearance, this fish is generally sold as a tropical species for inclusion in home aquariums. In truth it favors water of 62-70 F (although it is tolerant of higher temperatures), may reach 24 inches in length (39 inches by some accounts) and can over-winter under ice in water of sufficient depth. Chinese sailfins are, therefore, much better suited to an outdoor pond than an aquarium. Clad in tones ranging from golden-brown to rusty-pink (breeding males are red, females dark purple) and with 3 broad, dark vertical bands, an enormous triangular dorsal fin and comically small head, this bottom-dweller is quite a sight! It does best in groups, is peaceful in the extreme, and fares well on a diet of Koi or Goldfish Pellets and Algae Wafers (they are decidedly vegetarian in their food preferences). Chinese sailfin suckers present no difficulties over and above what you might encounter in keeping koi or goldfish outdoors, and will add a great deal of character and interest to your pond. Native fishes also present fine opportunities to expand upon your collection of “outdoor fishes”…some mix well with typical pond fish, and without exception all are very interesting. The cutlips minnows and burbots pictured here, while not very colorful, are fascinating to keep and very hardy. 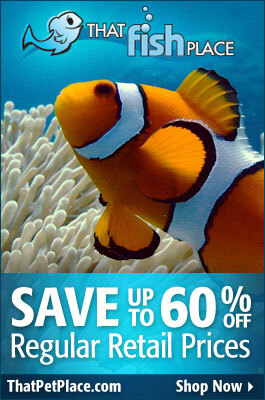 Please look for my articles on keeping native fishes in the future. A synopsis of what little field research has been done with this fish is presented in Current Zoology.